Distributors, contractors, and retailers from across North America participated in the construction of Aquascape’s 250′ x 90′ signature water feature under the direction of Ed Beaulieu, Chief Sustainability Officer for Aquascape. Initial excavation began several weeks before more than 600 eager participants representing over 250 companies arrived for the “World’s Most Extreme Pond Build” from July 12-16, 2008. The Extreme Pond Build provided advanced hands-on training for hundreds of Aquascape customers. 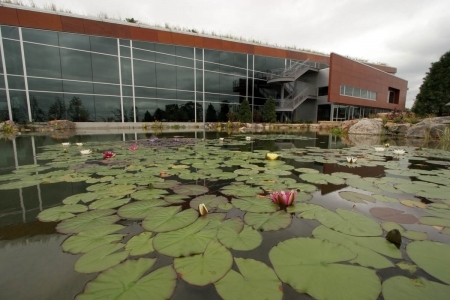 Since the interior design of Aqualand, Aquascape’s headquarters in St. Charles, Illinois, incorporated bringing the Illinois prairie inside the building, Beaulieu wanted to take that philosophy one step further by recreating the Illinois watershed in the extreme pond’s design. The north end of the pond mimics the craggy bluff topography of Jo Daviess County, where the Galena, Illinois home of Ulysses S. Grant resides. The ancient glaciers didn’t quite reach the northwest corner of Illinois and the area is now a popular vacation spot with magnificent scenery bordering the Mississippi River. Limestone and sandstone mixture, along with some rocks from Galena were procured for this area of the pond. Toward the southern end of the 250′ long water feature, a variety of aquatic plants were added planted to resemble a painting of Monet’s garden. Over 200 hardy, day-blooming water lilies were planted by numerous contractors led by Steve Stroupe of Davis Creek Marketing Group, Inc. The wetlands area is approximately 85′ x 10′ and is divided into two bog areas, measuring 35’x10′ and 50’x10′. The underground Centipede™ Module creates a 93% reduction in water velocity. Water moving through natural wetlands has a slow speed, and Beaulieu wanted to ensure that same lazy attitude. The pond contains a vanishing edge near this location. From inside the building, a blur line occurs where the water ends and land begins, creating a stunning view. Aquascape’s signature pond is bisected by a large grassy peninsula at the eastern edge, which makes way to flat limestone slabs that act as stepping stones toward the building. Up to 150,000 gallons of water per hour flow over the stepping stones. The water is approximately 3 to 4 inches deep over one of the stones. The rest are located above water for easy stepping. Transitioning from the stepping stones to the building is a series of man-made deck “stepping stones” created from recycled plastic. Beautiful water features intertwined with pathways, seating areas, ornamental shrubs, flowers, and more help you visualize a pond, stream, or waterfall in your very own yard. Take a stroll through the AquaGardens, located on the west side of Aquascape’s corporate headquarters, better known as Aqualand. 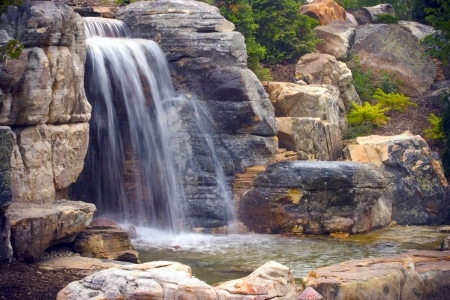 When you visit the AquaGardens you’ll experience the joyful sight and sound of running water as you view an ecosystem pond, Pondless® Waterfalls, bubbling urns, fountain rocks, and more. Let your imagination wander as you dream about what a similar paradise would look like in your own landscape. Every day can be a vacation when you enjoy the peace and serenity of an Aquascape water feature. The AquaGardens are open to the public year-round during daylight hours. Located at 901 Aqualand Way in St. Charles, IL.